In the spirit of these realizations, here’s a practical look at performance moves that will give you the biggest bang for their buck in terms of learning time and audience response. 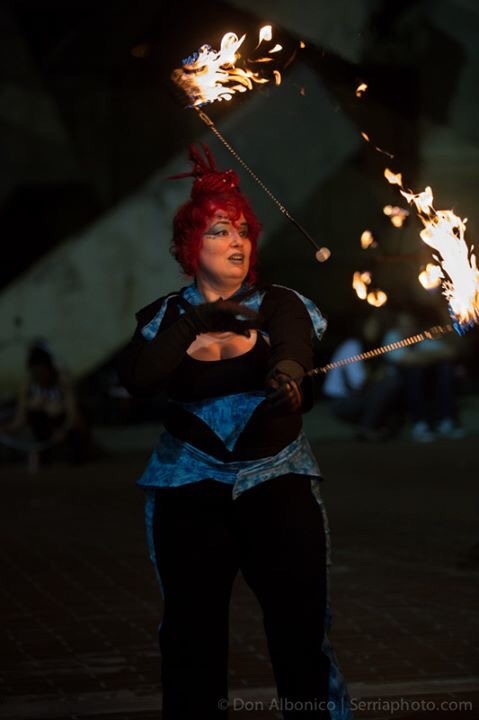 A few years ago I published an article, GlitterGirl’s Top 5 Crowd Pleasing Poi Performance Moves, which I went back and read after starting this article… because I’d forgotten I’d written it. Unsurprisingly, the list is a bit longer now and has some new additions, although there’s some other stuff on the old list you might enjoy checking out as well. To begin, clearly we’d be remiss if we didn’t mention the buzzsaw, an obvious example of a move that gets fantastic crowd response from non-spinners. These days, people almost always combine backbend with the word buzzsaw, although our experience is that any buzzsaw on fire will get almost any inexperienced crowd to respond even though they may well respond more when you add some other body movements that make it look even cooler — like a backbend, lung, or lying on the ground and doing a the buzzsaw while folded back on yourself. Here are 10 additional poi performance moves non-spinners notice. Tosses. Personally, I was late to the game with tosses in my own practice due to some limitations in my hands from my RSI so my experience with them is only 7 months practice or so. I had an opportunity to try them out recently in the park with my led poi and that showed me just how much crowd response tosses really get. It doesn’t seem to matter which type of toss it is as long as the crowd can see that you’re tossing. It may be that the tosses under the leg got a little more crowd response than other tosses, but all of them got some response. Turn-arounds moving quickly. Where a turn is moving 180º from one direction to it’s opposite, a turn-around combines two 180º turns to create a full 360º pattern moving from one direction, to its opposite and back to the original starting position while turning either right or left the entire time. Turn-arounds have varying levels of success depending on the moves but surprisingly, the weave and wiggle turn-arounds are two that garner a lot of crowd response, perhaps more so than antispin 4 petal flower turn-arounds. As an artist, I have to wonder if the audience is simply too in awe when they see the 4 petal versus the 3 beat weave turn-arounds to react though, consistently, a fast paced weave turn around is a crowd pleaser even when the flower gets no response on the applause meter. Dramatic speed changes. This could be double stalls, up stalls, stopping, changing between isolations and non isolations, size differences in the props, drags on the body, moving one poi fast while moving the other slow and other ways in which you can add this drama. Many poi artists are still executing at a single speed throughout their performance so speed changes can look a lot more dramatic as this is an underutilized technique overall. 4 petal antispin while walking in a straight line. As crazy as it sounds, my consistent experience as an artist is that non-spinner audiences appreciate walking quickly with the 4 petal flower across the stage in a straight line more more than the 360º turn-around 4 petal antispin flower. That’s good news for artists though since it’s a whole lot easier to only learn one direction and walk with it than it is to learn the turn-around. Holding the fire in your hand. As poi technique expands, it seems the art of playing with the fire itself has been diminishing in importance. 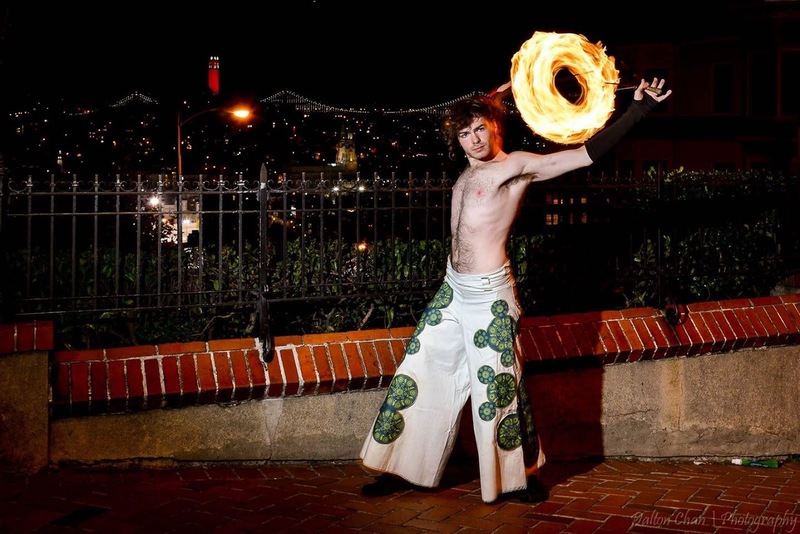 As an old-skool fire dancer, I have to say, you’re missing out on a fantastic opportunity if you’re not playing with the fire itself. Not only is holding the fire in your hand a fabulous move, but anything you do where you actually rub the fire on your body almost always gets crowd response. This could simply be a slow drag of a fan up your leg or even dragging a poi up your body. It could even include one of my favorite things to do when I was bald: rubbing the fire on my skull while the poi heads were in my hands. Though this isn’t a “poi move” per say, there is a certain amount of skill necessary to get the poi into your hand smoothly and cleanly so that you can grab the poi head so while it’s got low technical merit, this trick is not one to overlook. Tap-backs on your body. A natural follow-on to holding the fire and and rubbing it on your body is also to wrap the poi on your body. While single wraps can get some crowd response, emphatically, a series of 4 or more tap-backs in rapid succession will often awe the crowd too hoot and holler in your favor. This could be arm, thigh, wrist, ankle, hands — wherever — but a sequence using them consecutively allows the audience the clearest understanding of what you’re doing and has gotten the most response I’ve seen. Just like holding the fire in your hand, the illusion of danger is your ally in performance. Anything acrobatic. Often times doing a back bend with any move will get a crowd response — be it a butterfly, weave or buzzsaw. While that may not be considered acrobatic by some, couch potatoes will see back bends heading in that direction. Tumbling, cartwheels, splits and moves where you use the poi while doing interesting body movements all get crowd response. Also, while this doesn’t require much technique with the poi other than a clean way to put the poi down and pick them up, I’ve noticed crowds will respond to cartwheels sans poi during the cartwheel itself. Of course cartwheels with the poi can be done — Nova executes several variations including one where both poi are in one hand in a long arm extension, one where he does a one handed spiral in the one handed cartwheel and one where he does an orbital in the cart wheel. You’d think the last two would get more crowd response but I think the crowd has no idea what’s actually going on and they don’t actually applaud harder for the harder version of the cartwheel. Under the leg moves. Not all under the leg moves get crowd response and, in fact, it’s often the case that a single under the leg transition goes by so fast that the audience doesn’t even get a chance to see it, let alone process how awesome it is and have time to applaud in response. As a result, repeating the under the leg pattern consecutively, like the tap-backs in item 6, can garner some fantastic crowd response. Whether you’re doing moves that go from front to back or back to front, it seems the audience responds more vocally when they see the fire shoot out from under the leg so if you’re poi are going from back to front, show the front of your body and if you’re poi are going from front to back, show the back of your body. If you’re doing both, all bets are off. Infinite spirals. Simply put, audiences are in awe of these. While spirals can sometimes get some crowd response, the repetitive nature of the infinite spiral gives the audience time to understand the pattern, notice and react to it which the spiral itself is less able to do. Orbitals. Although the orbital looks similar to the buzzsaw to the untrained eye, the orbital moves much more quickly and can be moved around the body in interesting ways. As exciting as crowd response is to the buzzsaw, it’s equally if not more exciting for the crowd to see orbitals. If you’re an artist looking to start charging for performance, need some business coaching or choreography instruction, please contact GlitterGirl or comment on this post with a valid email to which to reply (we won’t post that part or even the comment if you specify! ).